We like our clients to know what they might expect from their long-expired film. This tab is designed to help you decide if it is worth pursuing the development of your old film or, in the case of newer, more recently-expired film, if our service is necessary. As you read what follows, please understand that we can’t speak in definitives but instead, we must talk about trends and generalities. We keep careful records on how each type of film we process trends in a given process in terms of quality. For example, just because Kodacolor-X roll film normally comes out fairly well, sometimes it does not. Keeping detailed records means that we can see if a film is trending poorly in a certain process and then move it to a more aggressive process. This normally means we are processing color films into black and white. It also means that a film designed for projection as a slide will not be processed into a positive image but instead into a negative. This is because we can salvage more from the film that way. With the exception of Kodachrome type film, you may request your color film be accelerated in our high contrast color developer. It is rare for us to advise you to do this extra step with most color films greater than 20 years beyond their “process before” date. There is more to consider than just age. 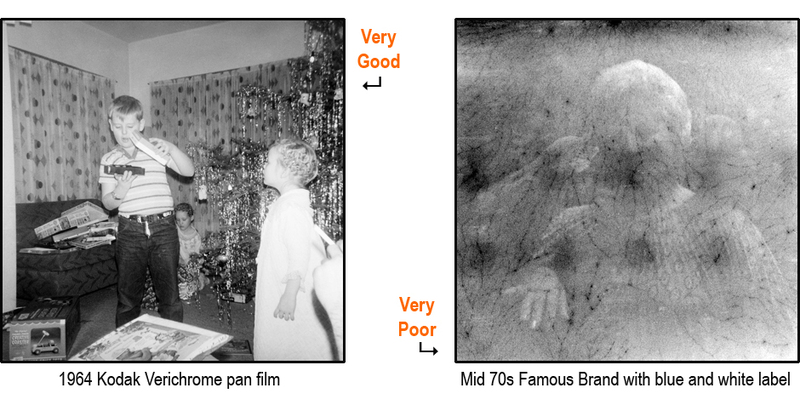 The quality of the vintage films that we process is highly variable. Below is detailed information on the factors that affect the quality of your unprocessed vintage film. Age is a big factor indeed but you can’t assume that newer film will turn out better. For example, we get films such as Verichrome Pan that generally come out ok, even though some date back to the early 1950s whereas a Fuji color film that is only 10 years old can be challenging to get a picture off of. We get Kodak Disc films generation 1, from the early 80s that we almost always salvage much better quality pictures from than we do from Kodak Disc film generation 6 and 7 from the early and mid 90s. It’s really hard to make generalizations in this regard. Older Black and White films do generally come out better than the same vintage of film that is color but not always. A newer film of a given brand and type generally turns out better than the same film that is older and stored in the same way but not always. As a rule of thumb for color film, you will likely be okay with normal local photofinishing if it is less than about 5 to 8 years beyond it’s ‘process before date’ and has not been left in a hot place for any period of time. For black and white film, that time period extends to 15 to 20 years. Should the content of that film be extremely important to you Film Rescue is happy to offer our premium service to ensure the best possible image but there is a chance that service was not necessary. The temperature your film was stored at is very important – the cooler the better. The trend is that the closer to the equator an order comes from the poorer the quality and the closer to the poles the better. Even with climate control, people’s houses generally have a higher mean temperature in warmer climates than people’s houses in colder climates and this will affect the outcome of your film. This is not to say that we only get poor quality from people sending film from places like the southern USA or the Middle East. This isn’t at all true – it is only that the general trend is for poorer quality from film coming from warmer climates. Also worth mentioning, films of the same brand and type found stored nearer to the floor will generally come out better than those stored on a top shelf near the ceiling. Brand can be a huge factor as demonstrated by the above sample. Different brands trend better than others. Not to say anything about the quality of new Fuji film freshly processed but Fuji film, even a few years beyond it’s “process before date” , can be in absolutely miserable shape. Kodak, is the most common brand and on average there are more recoverable images than all other brands. The much less common 3M brand of film also trends pretty well. Both 3M and Konica brand films were often relabeled by after market sellers such as K-mart or Right Aid. Konica film trends much poorer than 3M. Triple Print is extremely variable with quality trends ranging from good to very poor. Agfa brand motion picture film often comes out dirty and requires multiple re-washes whereas Kodak brand movie film generally comes out clean. Both terrestrial and cosmic radiation will take it’s toll on your film regardless if the film has been stored in a hot or cold environment. On occasion we’ll receive film that been in cold storage for 40 plus years. While this film will be in much better shape than it’s non refrigerated counterpart, there will likely still be significant deterioration. Some films stand up much better than others to radiation. This is not as big a factor as you might think. When we get a film from a client that turns out much better that we would have expected, we often contact them to see how the film was stored. Often we hear that it was stored in a wet damp basement. While we can’t be sure if the dampness actually helped the film, it didn’t seem to hurt. You are much better having stored a film in a cool wet basement than in a hot dry attic. We’ve even had success from film that had been absolutely soaking wet. Normally these films are only slightly affected and only damaged by the film sticking to itself or to the backing paper in the case of roll film. When we refer to film type or type within a brand we mean the different types of film a company manufactured. Black and white films generally come out better than color print films of the same brand and vintage. Color print films generally come out better than color slide films. One version of color print film from a company can turn out very different than another color print film from the same company. For instance, Triple Print Film made many versions of their color print film. The ones with the pink/magenta colored label trend fairly well while the ones with a black label can be a real challenge to salvage. These were both made within a few years of each other, but the quality trend is completely different. Roll films (films on a spool with backing paper and metal or plastic ends) such as 127, 620 and 116 have been protected a great deal from oxidization when compared to films that are loose inside a cassette such as 35mm, 126 and 110. The roll films can generally be expected to come out better than their identical counterpart. Motion picture films fall someplace in-between. Old film will fog from the edge to the middle. This means that the edges of a film are more affected by time than the centre of the film. Narrow gauge film such as super 8 and 110 will fog out faster than wider films such as 620 and 127. Roll film that has not been wrapped tightly will generally come out poorer than ones that have been rolled tightly. This is not a big issue unless you have poorly wrapped roll film or a motion picture film with a cassette or can that has been breached. Companies made and distributed their films in such a manner that they were totally impermeable to light.